This blog post was written by Carly Wilson. For years I have been interested in minimalism and the concept of pairing down one's physical possessions and filling the vacant spaces they leave behind with meaningful life experiences. I am also attracted to one of the major side benefits of minimalism whereby where one owns less, one wastes less. Minimalism is usually not intended to be an environmental philosophy but it often is, by accident. Over time, the quantity of my belongings has yo-yo'd up and down somewhat but I have consistently aimed to avoid worshipping 'things' and instead place my focus on the careful crafting of a meaningful life. Some of you may remember several years ago when I challenged myself to a one month 'buy nothing' challenge. Around the same time I also wrote about my awe of the uniquely Parisian ability to possess very few clothes while at the same time being incredibly stylish. I was recently re-inspired to examine my wardrobe after learning about something called Project 333. Project 333 is well known in minimalist circles but was unfamiliar to me. I investigated it after learning about it in the incredible film "Minimalism" which is available worldwide on Netflix. With a little research I learned that Project 333 originally launched five years ago as founder Courtney Carver's personal fashion challenge and has since been taken up by people all around the world. The challenge is to create a set of clothes, or "capsule wardrobe" as it is often called, that you will live out of for three months consisting of only 33 items. Included in the 33 items are all of your basic clothing items including shoes and accessories. Not included is underwear, pyjamas, lounge clothes you only wear in the house, gym wear (so long as you aren't wearing your yoga pants to do your grocery shopping), or sentimental jewellery that you never take off like your wedding ring. Everything else is boxed away until the end of the challenge. Every three months you put together a new capsule, swapping out seasonal clothing from your boxed up collection, and/or purchasing new items if necessary. The idea is for all 33 items to be things that fit, that you feel good in, and that you enjoy wearing. Everything else is removed to make mornings easier, cleaning easier, and to help you to feel more confident as you embrace your day. One of my good friends, Stacey, lives in Los Angeles and is a textile designer and former costume designer. I emailed her to ask if she had ever heard of this challenge and she told me that she had actually also just learned about it through watching "The Minimalists" on Netflix and had started making a list of the 33 items she would choose if she were to do the challenge! That blew us both away and we decided to take on the challenge together. This past week, we both whittled our closets down to 33 items each and started the three month challenge on May 1st! I thought it would be fun to blog about our journey as we go so here are a few thoughts from the both of us on our third day of the challenge. Everything Stacey donated to charity before starting Project 333! "What inspired you to take on this challenge?" Carly: After hearing about Project 333 through "The Minimalists" I realised that I, like almost all women of the western world, had a ton of clothes. I should have looked great every day for how much clothing I had but I didn't at all. So often I'd catch a glimpse of myself in a store window or the mirror in an elevator and be disappointed with how I had put myself together. Project 333 and the concept of designing a wardrobe with intention really struck a chord. 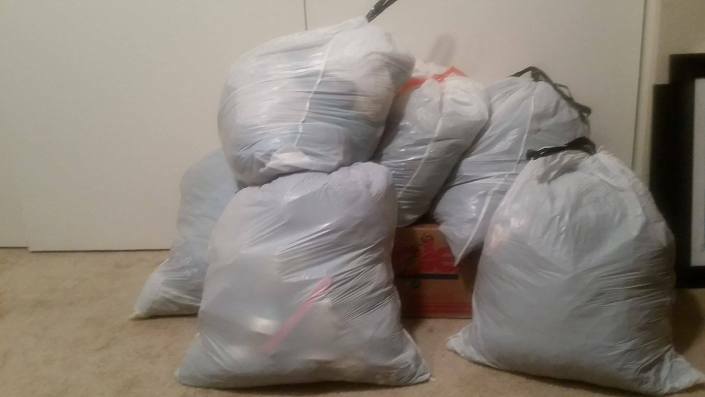 Stacey: After watching the documentary "Minimalism" and learning about Project 333 I immediately started cleaning out my closet. I began getting rid of things I didn't like anymore, things that didn't fit right, things I just don't feel good in, or things that I hadn't worn in over a year. At first I thought 33 items was far too few, but it seemed like a fun challenge, so I decided to give it a shot. After going through my closet I realised this is totally doable for me, and may even be a great chance to flex my creative muscles. I also thought it might help prevent me from buying things I don't need. In this culture of "fast fashion", we often make impulse buys that in the moment we think we have to have, but then once we get home we realise we don't have a lot to go with them, so we end up buying more stuff just to go with the other stuff we just bought. I've definitely been guilty of this, so I thought narrowing down my wardrobe to 33 items might help stop me from buying frivolous garments I don't need. Carly: At first, I was pretty daunted by the whole thing but I read an article about 33 things to eliminate from your closet and discovered that I had a habit of hanging onto sentimental items – think, old running t shirts from high school – and sparkly things that rarely, if ever, actually made it onto my body. Giving myself permission to let go of these things was really a big breakthrough for me and helped get the ball rolling on my journey down to 33 things. Now that I have finalised my 33 items I feel like I can breathe easier when I walk into my bedroom and getting dressed in the morning is unbelievably easier. Pairing down my wardrobe has also inspired me to let go in other areas. I have gone a little de-clutter crazy this past week, selling lots of things and donating others. My home now feels much lighter and is easier to keep tidy. It's a great feeling. I must admit, though – the day after officially pairing down my closet to 33 items, I did have a small freak out. 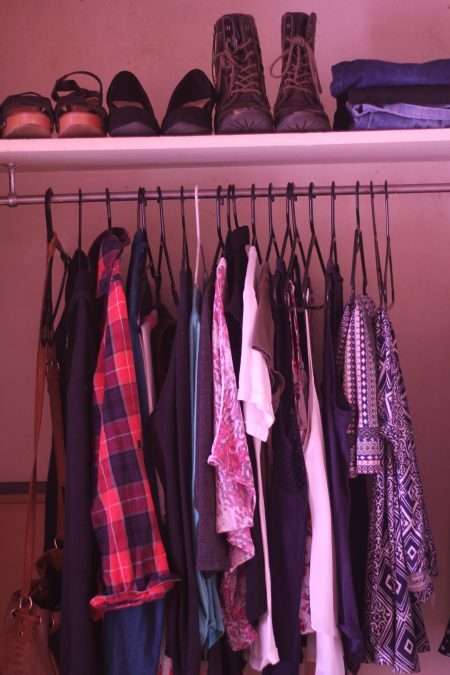 My closet looked so bare and I wondered if this was all a big mistake! It didn't take much to reassure myself, though, that if there really was some kind of fashion emergency, clothing is never hard to come by and I still had that box of clothing in the other room. Stacey: So far, it's been fun! I hate clutter, and nothing makes me feel better than having a well-organised, clean space. Now that my closet is organised and de-cluttered, I feel like I can think more clearly when I go to choose my outfit for the day. The beauty of the challenge is you don't have to get rid of anything you don't want to. You can just pack it away for a few months and then bring it out in your next rotation. There have been a few beloved tops of mine that didn't make the cut this time, but I know in 3 months I'll be so excited to swap something out for them. 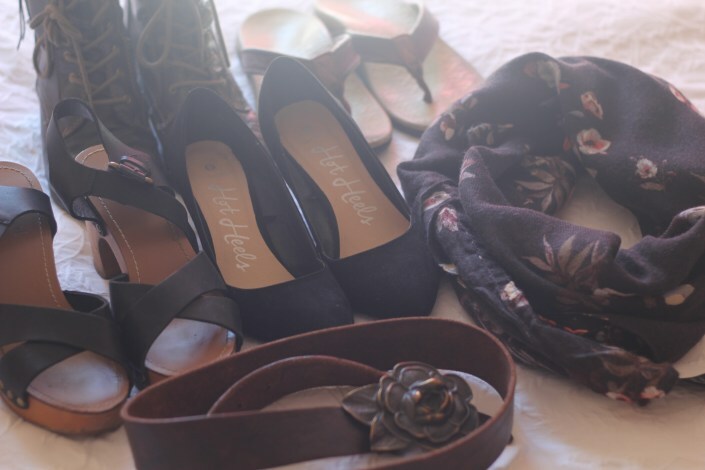 My only shoes scarf and belt for the next 3 months. "What did you struggle with most as you paired down your items? Carly: Jewellery! I have well over 33 pieces of jewellery alone and I really enjoy wearing it so this is a hard one for me. It's been interesting, though, because often I don't wear any jewellery. I used to wear lots of jewellery every day but when I started working with wild parrots, that stopped. I also have so much jewellery that I think it stops me from wearing it in a weird way. At the start of the challenge I had a hand-shaped ring holder overflowing with rings and bracelets and two little bowls of random earrings and pendants next to it that were right in front of my jewellery box, blocking access to it. Often, it was easier not to wear anything than to sort through the collection. I think that after the 3 month experiment is over, I will continue dressing in a 33 item seasonal wardrobe but may allow myself to still keep a jewellery collection – albeit a paired down one. Stacey: I think the biggest challenge for me is finding a balance between having pieces I can mix and match, without creating a bland and boring wardrobe. I love textiles, and am obsessed with prints, colour and texture. However, those things often create statement pieces that don't mix and match well. I've found I have to be very careful not to incorporate too many statement pieces into my 33, or I won't be able to creatively mix and match pieces as well. On the flipside, I also don't want to have a boring mix of solids and neutral colours, so there need to be a few pieces in there to kick things up a notch. "Did you purchase anything new for your capsule?" Carly: Courtney Carver, the founder of Project 333 recommends that you don't buy anything new for your first 3 months. She says that building your first 'capsule wardrobe' using what you already own will help you work out what you really want and need. For that reason, I didn't buy anything new for the first capsule but I was very tempted to! Stacey: Not this time around. I think part of the fun of this challenge is not buying anything new for a while. I think it will really help change my perspective on when and why I buy clothes. "What are you looking forward to most in doing this challenge?" Carly: Quite simply, I'm looking forward to dressing like a grown up for once in my life and finally learning how to put an outfit together properly. I know I am going to learn a lot from doing this challenge with Stacey – she is so much better than me at the whole fashion thing! It's funny that what it took for me to finally get interested in clothing was to get rid of most of it! I'm also looking forward to contributing far less to the culture of fast fashion by learning how to dress in quality staple pieces that can be mixed and matched, tend not to go out of style, and don't often need replacing.Stacey: I'm looking forward to coming up with new and creative outfit combinations. I think it will be really fun and will help me get out of the pattern of just wearing the same pairings over and over again. I'm also looking forward to sharing my outfit pics with Carly, and seeing what she comes up with! She's very creative herself, so I'm sure I'll be stealing some of her ideas from time to time. Carly Wilson is a filmmaker and environmental professional specialising in wildlife care and habitat management. She also blogs on her personal website. Right now she is making a film about the effects of released helium balloon on the marine environment. Please follow her on Twitter (@carlycreature) or through Facebook if you would like to keep abreast of the film's progress.